"Trying to make the world better one tweet at a time"
We hear so much about the dangers of cyberbullying. How would you like to hear about social media being used by teens for a good purpose instead? That sounds much more optimistic to me! This video introduces us to Jeremiah Anthony, a junior at Iowa City West High School. Jeremiah started the Twitter account @westhighbros to tweet compliments and encouragement to friends. Recent tweets, as of this post, included such things as "You are really unique and talented," "You make the best of everything that comes your way," and "You are smart and can find the humor in every situation." His Twitter bio says, "Trying to make the world better one tweet at a time." I think he's doing that, don't you? Good job, Jeremiah. Find out more. 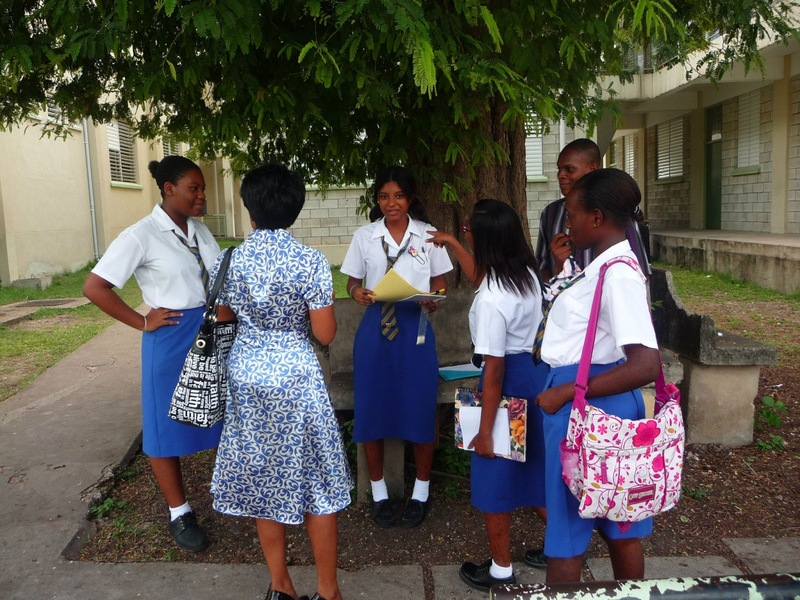 Sometimes, service clubs are needed to start a movement. 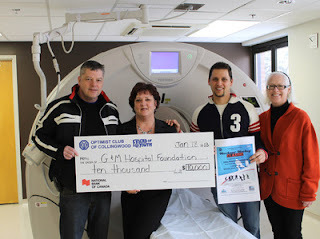 The Optimist Club of Collingwood, Ontario, Canada, is hoping that their pledge to raise $10,000 for the Collingwood G&M Hospital Foundation will start such a movement in their community. The movement: to bring new equipment and technology to their community in order for children and other residents to lead healthier lives. The Optimist Club has pledged to raise this amount of money over the next four years by hosting fundraising events that will involve the community. The first event is a four-on-four hockey tournament on February 9. It's an opportunity to see good, old-fashioned Canadian hockey, claim the organizers. "The Collingwood General and Marine Hospital's New Age of Care Campaign is bringing in equipment and technology that will impact everyone. We are so pleased that the members of the Optimist Club share our vision and have supported our cause," states Jory Pritchard-Kerr, Executive Director of the Hospital Foundation. By starting with the amount they can handle, and promising to do more, the Optimist Club of Collingwood is making a difference and inspiring others to make a difference too. Read more about the project at Simcoe.com. In a motivational note to the members of the Caribbean District, Governor-elect Simon shared that nugget of hope and wisdom. I've seen it happen; individuals and their respective Optimist Clubs get so caught up in the potential of their ideas that they spend most of their time planning and little of their time doing. They talk a good game, but fail to take action. We don't have enough members. Both speak to the beauty of Governor-elect Simon's message. Help those you can, when you can and one day your club may have the capacity to do more. Your Optimist Club's good deeds will draw attention and others to the cause. And if it doesn't, you will still have made a difference because you gave of yourself in service. Photo courtesy of JOOI Barbados on Facebook. Jason Mraz usually makes me smile and that's generally why I choose a song for the Music Sunday post at Experience Optimism. However, today my smile is bittersweet with "93 Million Miles." Jason sings of his mother, father, and experiences near and far, arriving at the conclusion, you can always go back home. For many, "You can always go back home," isn't necessarily true. Times changes, places change and people move on and sadly, ultimately, die. Home stays in the heart, but is only a memory; and I find it to be one that brings as many tears as it does smiles. Open your heart and mind, share your tears and smiles, and memories with "93 Million Miles" by Jazon Mraz and then consider this quote from Elie Wiesel, "Memory feeds a culture, nourishes hope and makes a human, human." According to Jim Stockman, a member of the Downtown Optimist Club of Indianapolis, Indiana, optimism is nutrition for the mind. In 2009, the Downtown Optimist Club celebrated 90 years of community service. Producer Billy Myers interviewed club members about their experiences, attitudes and projects. It's easy to see how far reaching their programs are and how embedded their optimism is in their lives. Please watch and enjoy "Optimist International - 90 Years of Service." The Lake Orion Optimist Club is made up of "motivated people who want to make a difference in the lives of children in their community" and they went on-air and YouTube with Ontario Neighborhood Television to tell their story. Chris Barnett and Katherine Baumann explained to Orion Outreach that they have added to their mission this year in an effort to reach out in service to everyone in the community. Nonprofits are encouraged to partner with the Optimist Club for both fundraising and volunteer service. The video explains some of the programs of the Lake Orion Optimist Club and it's easy to understand how Optimist Clubs are encouraged to be autonomous and to do the projects that are most needed in their communities. According to Barnett, the Optimist Club is a great place to find yourself. If you think you want to volunteer, but not sure where to start, the Optimist Club has projects that will inspire community service and foster friendships. Do you have a project that needs helping hands? Connect with the Optimist Club in your community or work together with your friends to start a new Optimist Club. You'll enjoy the fellowship in service. I promise. The Lake Orion Optimist Club can be found in Lake Orion, MI. My three words to live by in 2013 are share, mindfulness, and active. Last week on Music Sunday at Experience Optimism, we looked at what sharing means to me with Gavin DeGraw's "Soldier" and I promised to look at my other two words in a future post. Today's post brings us to my second word: mindfulness. I'm not at all into meditation and I don't, at least at this point, practice yoga. However, last year as part of my work with the Idaho Occupational Therapy Association, I attended a half-day seminar on mindfulness. I learned how being more aware of our surroundings and our bodies would bring balance to our lives. I believe such balance brings happiness. It can also bring peace. I was heartened to find this exercise on YouTube today because it demonstrates the balance that I hope to achieve. "The STOP Practice," is a simple way to begin to understand mindfulness. Please try it. According to research at the University of Massachusetts Medical School, mindfulness is known as a therapeutic intervention to relieve stress. Through practice, mindfulness can help the areas in our brains grow to develop better memory and learning skills, and alleviate depression. Read "Mindfulness practice leads to increases in regional brain gray matter density" to learn more about its properties and possibilities. I invite you to join me for a quiet version of Music Sunday with The Stop Practice exercise and we'll get back to rock, pop, rhythm and blues and the music that strikes my fancy, imagination or memories next week. I know that I should probably say that what I like most about belonging to an Optimist Club are the people. Working together with others who share similar goals and ideas for our communities is special and I do appreciate the friendships that I have made in my club and throughout the Optimist International organization. 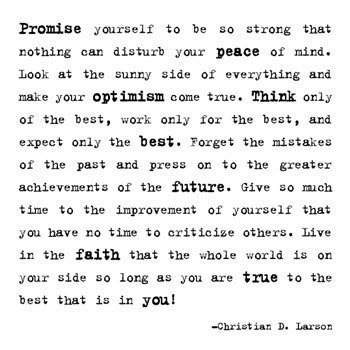 Download a printable copy of the Optimist Creed. As you might imagine, one can read and live by the Optimist Creed without belonging to an Optimist Club and while that is a good start, your purpose is not complete until you share your commitment with others. Optimist Club members promise to share a positive way of life with others. They support one another, and their communities, with this dream and draw strength from one another in order to fulfill it. You, and those around you, will draw the same strength by sharing optimism with others. Join an Optimist Club and be a positive force for good in your home and community. 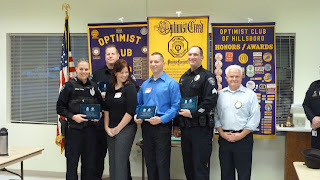 On December 11, 2012, the Optimist Club of Hillsboro, Oregon honored police officers for their service during the annual Respect for Law Day. The event began as a way for Optimist International and its clubs to bring children together with first responders so they might build positive relationships rather than one of fear or as consequences of bad behavior. It has grown into an activity that clubs celebrate in their own manner, and a great number of Optimist Club do as the Hillsboro members have done; they recognize officers for their commitment and say thank you for their service. I especially like this picture because of the backdrop. The Optimist Club banners are a brand that shows this club is active in their community. One can tell by the badges and awards that have been sewn onto the banners that the Hillsboro Optimist Club has a strong history of engagement and success that will lead it well in the future. The backdrop tells a story as broad as the people who are in the picture. I hope you take notice of the backdrops you use in your photos so that you might share your Optimist Club story with pictures, feelings and words. Photo courtesy of Sarah Newton. Following Chris Brogan's lead, I've chosen my three words to live by in 2013. The first is share and this song, "Soldier," by Gavin DeGraw speaks to what the word really means to me. On the social web, sharing is currency. We share tweets, links and posts. In real life, sharing often means giving something with or without expecting something in return. However, for me, to share is a responsibility that moves both way. One has to be willing to share and another has to be willing to accept that consideration. On the popular sitcom "Big Bang Theory," socially awkward Sheldon Cooper struggles with the concept of gift-giving by making sure that he reciprocates at an equal value. The responsibility isn't, as Sheldon sees it, to give a gift in return, but rather to accept the gesture graciously. This video celebrates the acts of sharing and accepting. Both are worth celebrating. 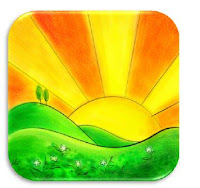 My other two words are mindful and active and we will explore them in the coming weeks; but today, please enjoy Music Sunday at Experience Optimism with the brave and encouraging "Soldier." Attracting new members to service clubs presents an ongoing conundrum. It's both hard and easy to do. After all, we belong to a service club, be it Optimist, Rotary, Kiwanis or Lions, among others, because the association meets our needs. When it stops meeting our needs, or when we start missing meetings, it is time to take a look at the formula. If it's not meeting our needs, how can we expect it to meet the needs of others? For attracting new members, there is no single formula or capsule that a club can adopt. The club has to approach the situation from all directions. The word that comes to mind from this post is "inviting." Your club has to be known, be seen and provide an open, welcoming environment to all; but perhaps most important is your personal responsibility to the club. You have to be inviting as well. Literally, you have to be inviting those you meet to experience the club, its projects and programs, and to join. Simple reminder, friends: just ask someone to join you and your service club and then work together with them and other members to ensure it meets their needs. When you include new people and proactively work to meet their needs, you'll find a formula to help your club constantly improve and remain relevant to all. Just be inviting and your service club will grow. On a certain day for 15 years, Steven Addis has stood on a corner in New York City with his daughter, Sabina, in his arms. During this Ted talk, Addis describes, in 15 photos, how he has made, and will continue to make memories with his daughter. He encourages viewers to "get in the photo" and make memories with your family and loved ones for yourself. What struck me most about this video was the act -- the ritual -- that the father has created. We allow ourselves to become participants in rituals that have been defined by religions and governments, and even corporations. Consider Christmas Day and Thanksgiving Day, among others. Think even of your birthday. Hallmark has made certain that it is celebrated with a birthday card. What would those rituals look like if we created the memory of the occasion with our own ritual, one that adapts as we mature and our lives change, but is always practiced. What if we allowed ourselves to stray from the expected and be creative with how we celebrate the milestones in our own lives. What if we took control of the experiences that make our journeys through life more pleasant? Think of how much more fully we might enjoy those around us if we gave ourselves permission to celebrate ordinary, perhaps daily, acts. Taking time to be there, in the present, is truly a gift to share. Steven Addis: A father-daughter bond, one photo at a time, via Ted. A new year brings opportunities for new beginnings and for the first time in many years I am able to say that I don't think that I need a new beginning. I am happy with the direction that my life is taking me. I have decided to make only one resolution this year and that is to be more physically active, but I also promise to continue with this awesome project so that others may Experience Optimism in action through my words and views. 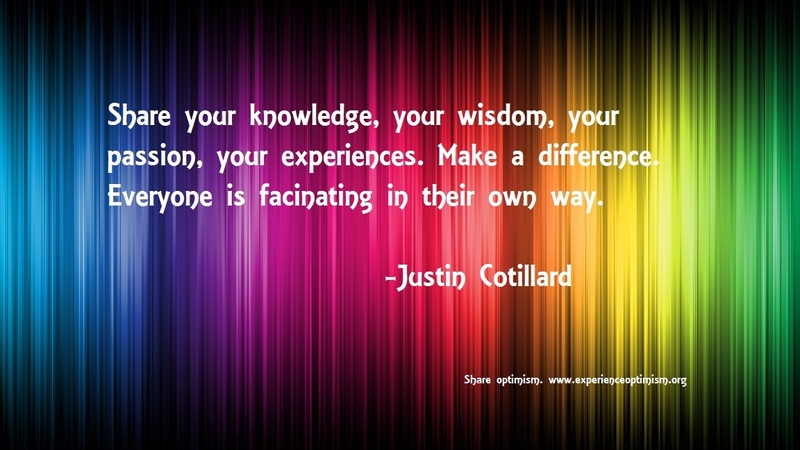 Last week, I found a quote that spoke to me. It sums up my wish for this fabulous new year that is upon us. 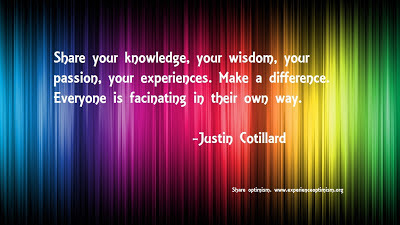 I hope that everyone shares their talents with others for I believe that sharing leads to true happiness. Happy New Year. Welcome to 2013.